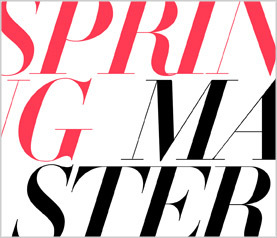 Its officially SPRING in my mind!….yes I realize it is still February, and a snow storm is on the horizon….BUT the 2012 SPRING MAC PRO MASTER CLASS list went out this week, and as soon as I received it, I signed up!! The best part….the fee for the class is redeemable in product!! I know. Right? Seriously! I get to learn and SHOP at the same time. The classes are held downtown Toronto at either the Mac Pro store on Queen (my favourite store ever) or the big Mac on Bloor. They close the store for the 3 hours and we get to personally shop with the Master Artist who is teaching the class after the lesson….they tell us what to buy, what we need, and what we dont need, and help us build our kit with the necessary tools and products!! (I know, like I need anymore makeup or brushes or tools…but) Its FUN! Im so excited, so far I’m signed up for the following classes this year!! This workshop explores trends, techniques and long-wear secrets that allows me to create a theme and personal palette for my bride and her party. I’ve participated in the Bridal Makeup Master Class every year and I STILL continue to learn new application techniques, and its always good to see the new bridal colour trends for the upcoming season! Working with clients who will be appearing on HD Camera or film requires knowledge of beauty makeup, trends and the ability to create a look that reflects a person’s individual style. This class is going to be lead by Gregory Arlt who has16 years of experience working with Hollywood celebrities (from Kim Cattrall and Pamela Anderson to Alicia Keys), who’ve appeared on Red Carpets for the Oscars, the Emmys, the Golden Globes, the Grammys, and the People’s Choice awards to name a few. We will review current Red Carpet trends, and how to achieve the Red Carpet looks for my clients! THIS 3rd CLASS IS THE ONE I AM REALLLLLLLLLLY LOOKING FORWARD TO THE MOST!!!! In this lab, senior artists will demonstrate the art of the mixing mediums. Being creative and enhancing my skills as we review the basics of colour mixing and learn how to create new textures and shades for editorial and airbrushing. Topics covered include blending your ideal colour, making your perfect mascara, cream eye shadow, lip colour or liquid metal. Eye Shadow Trio – SALE!